Apropos of Nothing: The Turbo Button ! Remember the "Turbo" Button ? What make/model is this? I've got one from 1992 or so that looks almost exactly like it*, and I've been trying for years to identify it -- there's no name on the case but "Plug Into The Power Of AIS 486: ADVANCED INFORMATION SYSTEM." 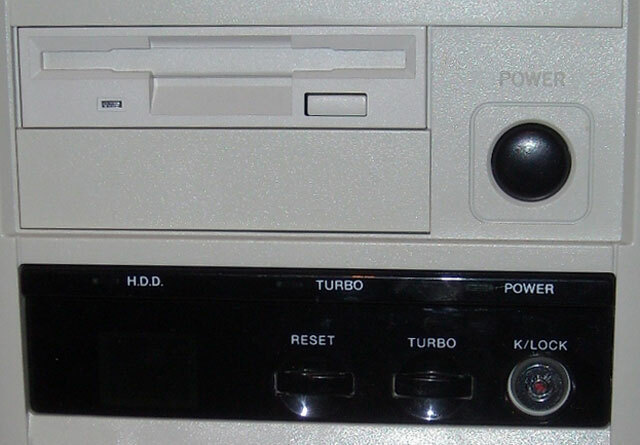 *Differences: The power button is gray and doesn't have the rounded rectangle around it, the labels say "POWER TURBO H.D.D." instead of the reverse order, the lock says "LOCK" instead of "K/LOCK" and has locked/unlocked icons, and the front piece is indented to the left and right of that whole black area.